The six Dantons (Condorcet, Danton, Diderot, Mirabeau, Vergniaud, Voltaire) were the last French pre-dreadnoughts. 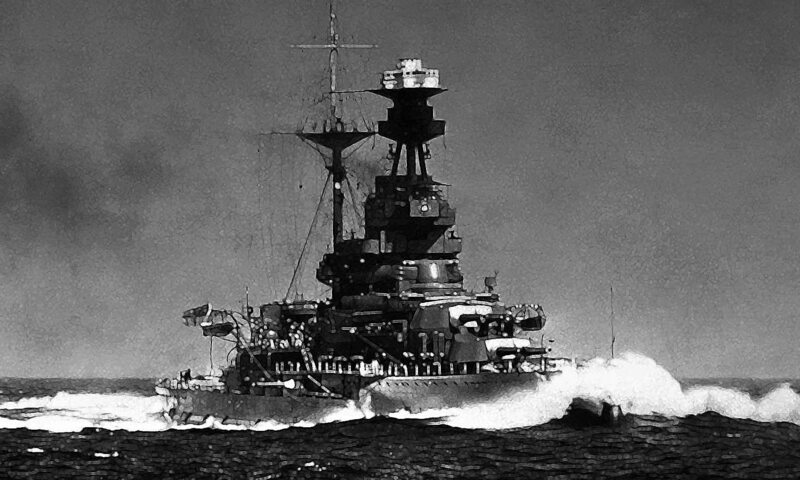 They had the misfortune to be ordered in 1906-1908, while HMS Dreadnought was launched. However, the planned construction resumed until the delivery of the six units in 1911, to be succeeded by the first French Dreadnoughts, the Courbets. The Danton spent their career in the Mediterranean, quite active in many theaters of operation. Danton at sea, Marius Bar coll. So France was delayed in this race because of these particular ships, but at the same time the Dantons were quite improved compared to the previous Patrie/Liberté classes. 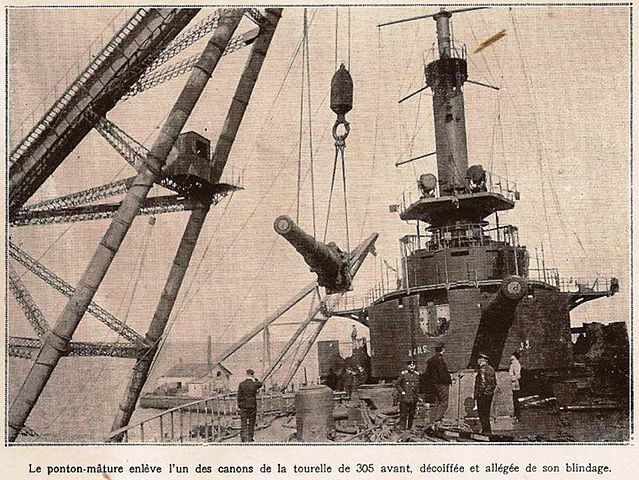 They claimed 18,300 tons instead of 14,800, to receive the first turbines installed on a French battleship. Practically regarded as “fast battleships” (20.6 knots in the tests against 18-19 on previous classes, they however had a low autonomy due to excessive coal consumption. For operating in the Mediterranean, however this was not such of a problem. 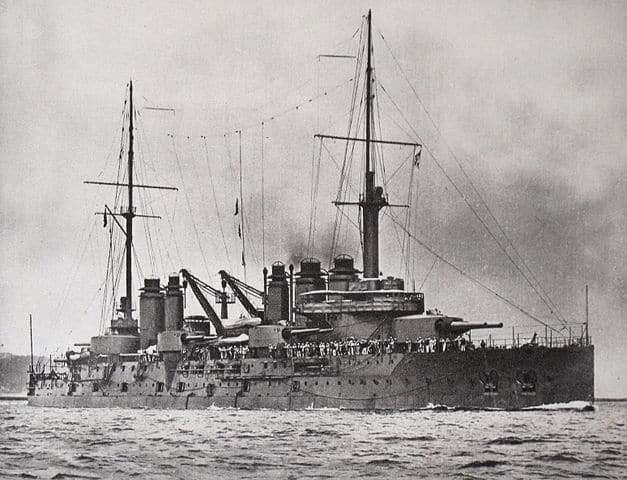 Not dreadnoughts, they however took into account Cuniberti’s design ideas and in addition to their main 305 mm armament, had a sizeable provision of 240 mm turrets, a compromise between the two types of battleships, a bit like the British Nelson class. 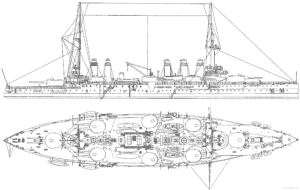 They used a new firing system modeled on that of the HMS Dreadnought in 1918: The British Barr & Stroud coincidence rangefinder. Range of their 240 mm guns increased from 13,700 to 18,000 meters. Rate of fire was also very good, and firing tests proved the validity of the combination of main and secondary calibers. The armor was not that advanced, but tertiary armament was singularly reinforced at the beginning of the great war: Indeed in addition were fitted twelve 75 mm mounted on the turrets which sufficient elevation and caliber to be used as AA weapons. These ships also carrid six Modèle 1909R torpedoes (114 kg (251 lb) warhead, 3,000 meters (3,300 yd) at 28 knots (52 km/h; 32 mph) or 2,000 meters (2,200 yd) at 33 knots (61 km/h; 38 mph) settings. There was also a storage space for 10 Harlé Modèle 1906 mines (explosive charge of 60 kgs (130 lb)). Total weight of the armor accounted for 36%, so 6700 metric tons. The main turrets had 340 mm (13.4 in) of frontal armor, 260 mm (10 in) sides and the roofs were given three layers of 24 mm (0.94 in) mild-steel plates. 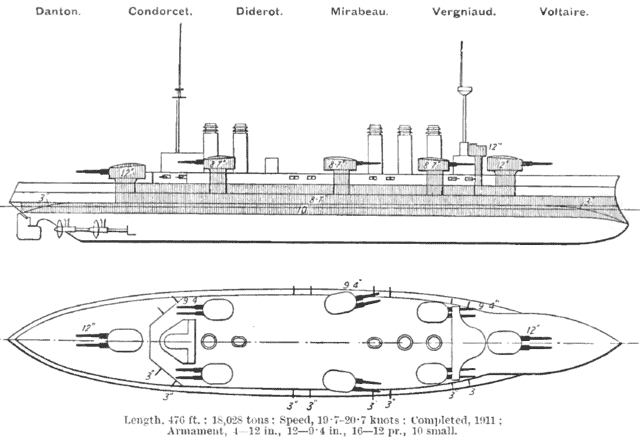 Barbettes had 246 mm (9.7 in) of armor thickness, down to 66 mm (2.6 in) below the upper deck. 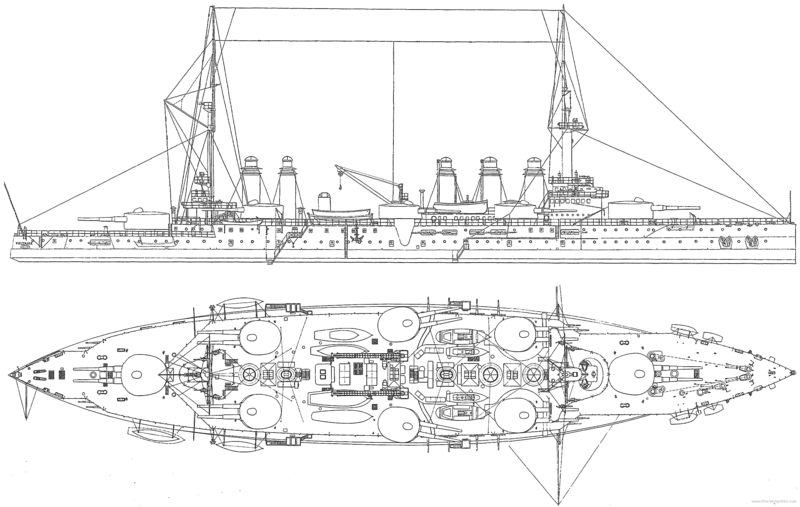 Secondary turrets had 225 mm (8.9 in) front, 188 mm (7.4 in) sides, 3x 17 mm (0.67 in) plates roof. The 240 mm barbettes were protected by 154 to 148 mm (6.1 to 5.8 in). The conning tower front had 266 mm (10.5 in) thick walls, 216 mm (8.5 in) sides. The communication tube down to the fire-control center was 200 millimeters thick. Noticeably, the ships had two protected decks formed from triple layers of mild steel, 15 mm (0.59 in) or 16 mm (0.63 in) thick. Each ship was fitted with four license-built Parsons direct-drive steam turbines. The steam was drown from 26 coal-fired Belleville or Niclausse boilers, each type being alternated on groups of three ships of the class. They were housed in two large compartments, 17 forward, 9 aft boiler room corresponding to the numerous funnels. The turbines developed 22,500 shaft horsepower (16,800 kW) total using steam at a working pressure of 18 kg/cm2 (1,765 kPa; 256 psi). Maximum speed as designed was 19.25 knots (35.65 km/h; 22.15 mph), but at sea trials they reached from 19.7 to 20.66 knots (36.5 to 38.3 km/h; 22.7 to 23.8 mph). Niclausse boilers burned however much more coal than Belleville boilers and copious amounts of smoke and sparks, even flames from incomplete combustion. Estimated range from 3,120–4,866 nautical miles (5,778–9,012 km; 3,590–5,600 mi) at 12 knots (22 km/h; 14 mph) was almost half that of their predecessors and they needed frequent coaling stops during the war. Condorcet was built at A. C. de la Loire, St Nazaire, Danton at Arsenal de Brest, Diderot at Chantiers de Penhoët, St Nazaire, Mirabeau at Arsenal de Lorient, Vergniaud at A. C. de la Gironde, Bordeaux, and Voltaire at F. C. de la Méditerranée, La Seyne-sur-Mer. The ships were named after Enlightment figures. Construction was prolonged by a number of factors: 500+ changes made to the original design and inability of the chief engineer to make timely decisions, meaning that the builders had to rip out some completed sections to incorporate modifications. Shortages of infrastructure at the shipyards, long delays in parts delivery, labor shortages, and lack of large building slips in the dockyards also explains it. 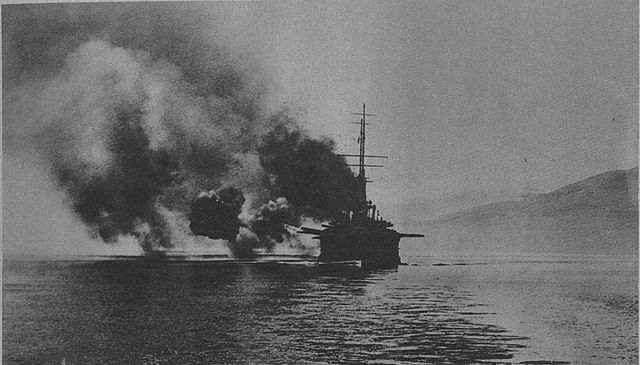 Danton’s class career was not spectacular, the Danton being the only recorded loss, torpedoed by the U-64 off Sardinia, while the Voltaire survived in 1918 to those of the UB-18. These ships fired warning shots at the Greek government in Athens to force the Greeks to rally to the allies. 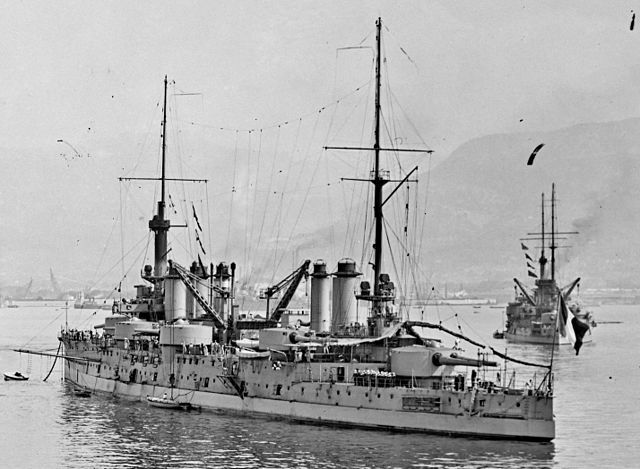 The same vessels (Diderot, Vergniaud, Voltaire, and Mirabeau) formed the squadron of the Aegean Sea alongs with dreadnoughts, deployed against the Austro-Hungarian fleet. On November 13, 1918, they were stationed in Constantinople. After the war, Vergniaud and Mirabeau set out for operations in the Crimea in 1919, bombing Sevastopol in the hands of the “reds”. But Mirabeau underwent a storm and was stranded, but saved and towed back to dock in 1919. Never repaired, she served as a pontoon for experiments, while the others undergone some modernization in 1922-25. This particularly concerned underwater protection, with fitting of bulges. These three ships (Condorcet, Diderot and Voltaire) spent the rest of their career as school ships. 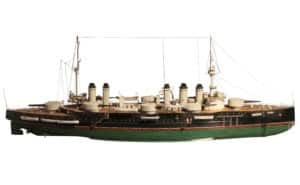 The Condorcet was removed from the lists in 1931 but still served as a training ship for torpedo boat crews, cleared of its armament but equipped with 4 Torpedo tubes on its deck, and was extant in Toulon in 1939. In November 1942 she was scuttled like the rest of the fleet, but remained afloat and was later repaired as a pontoon. In 1944, she was struck by an raid raid. She was towed and sunk by the Germans at the entrance of Toulon harbor and, after the landings in Provence, refloated. She was finally stored before demolition, which took place in 1945. The Voltaire had been converted into a pontoon since 1930, and was definitively condemned in 1935, but sold for scrap only in 1939. 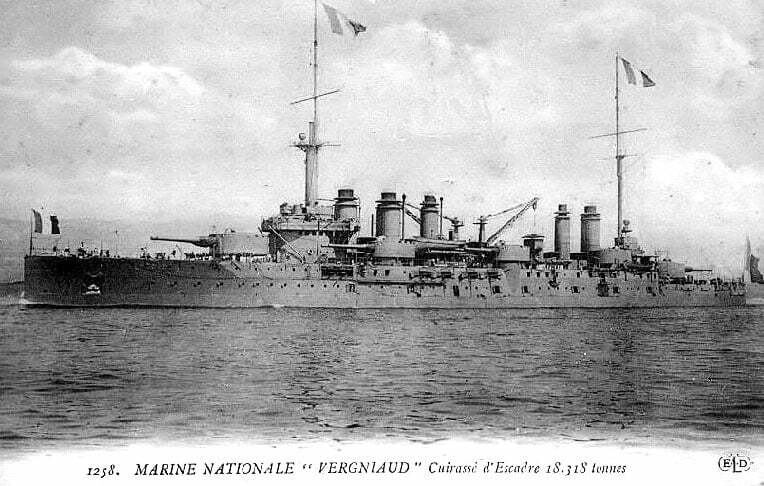 The Vergniaud served as a target ship after 1921 and was scrapped In 1929. Finally, the Diderot also served as a pontoon, condemned in 1936 and srapped in 1937. Propulsion 4 screws, 4 Parsons turbines, 26 Belleville/Niclausse boilers, 22 500 hp. 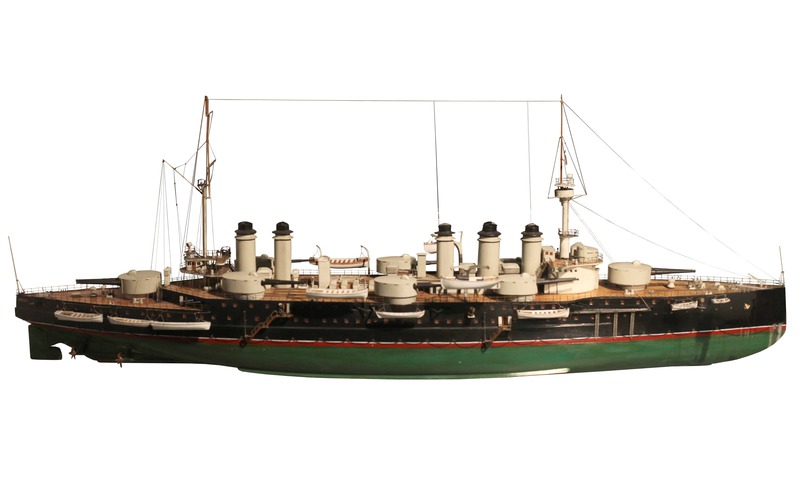 Shipbuilder model at the Musee de la Marine, Paris.